The word inspiration comes from the Latin and means, “filled with spirit.” An old traditional saying says, “An angel guides every act of creation.” Creativity comes from the spirit. 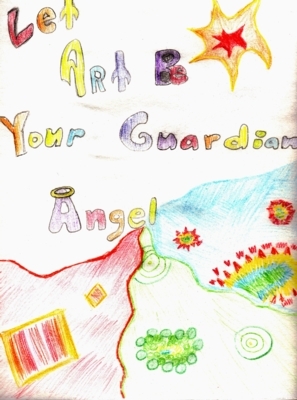 Your guardian angel/muse helps you notice beauty and inspires you to participate in creative acts. Creativity is part of your soul and your divine connection to the Universe. Creating is your gift back to the Universe. It is one way the Universe soothes and cares for you. What does your muse look like? They are masters of disguise and use anything and everything to inspire you. They can be as gentle as a breeze and as powerful as a raging storm. One may enter as a thought or sing to you through a song. The more aware you become, the more present your guardian angel/muse makes itself. They love attention! Your muse is there to comfort, guide, and inspire you. Your muse loves and adores you JUST THE WAY YOU ARE. I’m not kidding when I say your muse is an attention-seeking being. You are constantly urged to create and notice beauty for the pure joy it brings. It can be felt to the core of your being. Remember, art is healing! It is said that all emotions and feeling come from only two sources, love or fear. Judgments, I can’t, I’m not good enough, etc., etc., etc., are all fear-based. Your guardian angel/muse is pure love-based. What you create is true beauty to your muse because it is from your inner heart and soul, and nothing is more pure. Play with your muse. Watch and listen for its voice and messages. Take a minute or two and just look around where you are at this very moment. Did your eyes settle on something? Hear a sound? Notice a color? An object? A smell? Your muse is trying to communicate with you though all of your senses. It has total and complete unconditional love for you and never leaves your side. Make that connection with your guardian angel/muse. Every act of creativity on your part brings joy to the Universe and is returned to you many times over. Creativity is a spiritual connection. Hey! Name your muse and have great conversations! (No one needs to know!) If anyone overhears you and asks whom you are talking to, tell them you are a songwriter and are trying out new lyrics! “The process of creativity produces optimal conditions for being alive. As we create, our minds and bodies are their most energetic, stay vital, and even heal.